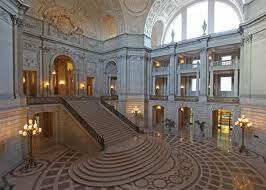 Have you ever been to San Francisco City Hall? If you have, you know how beautiful it is. 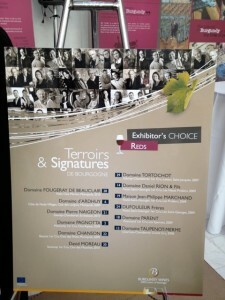 Well, that’s where the Terroirs & Signatures Burgundy tasting took place. 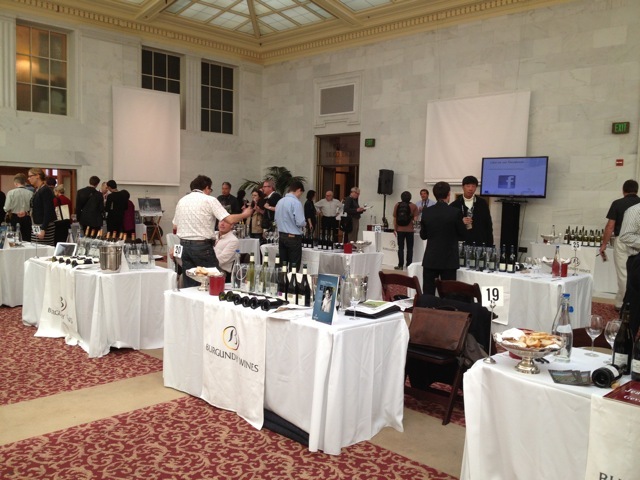 A grand setting for grand wines…most from the great 2009 vintage and some really wonderful 2010’s. 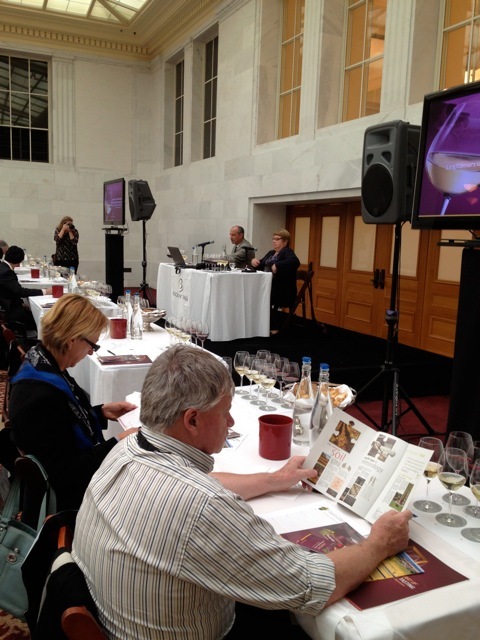 The tasting started off with a two hour seminar on Burgundy and its climat and lieux-dit presented by Gary Spadafore, CWE and Director of Education for Alliance Beverage and Anne Parent, Spokesperson for the BIVB – Bureau Interprofessionnel du Vin du Bourgogne – and also a wine producer herself (Domaine Parent). 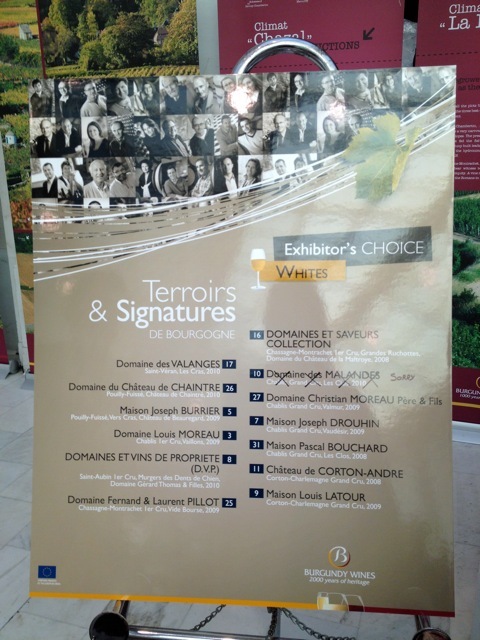 Climat is the Burgundian translation of the word ‘terroir’ which is different than a meteorological condition. 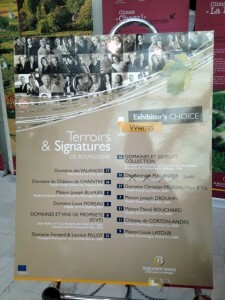 Particular to Burgundy, the term ‘climat’ designates a parcel of land dedicated to a precisely designated vineyard. It is a precise plot, soil, subsoil, exposure and microclimate which comes together within a vineyard that constitutes its personality, unique to one terroir and one cru. These ‘climats’ have created an extraordinary mosaic of vineyards with a hierarchy of crus and an international reputation. Lieux-dit , to put it simply, is a plot of land within a ‘climat’ than has its own particular characteristics. Really, the best way to find out what these terms mean is to go to: www.lesclimats.burgundy-wines.fr Aaargh, the site is still under construction. Well, keep it in mind. I asked if climate change was a consideration for the growers and the answer was that climate change was completely accepted but it was not looked at as a political issue. (How grown-up!) The growers deal with it by making technical adjustments as ripeness, sugar levels and alcohol have all gone up…and apparently they’re not complaining because the wines have been so lean. Hmmm, an up-side to climate change. Also a big take-away, aside from tasting fantastic wines, is that everyone in Burgundy, and probably all over France, is talking about organic, bio-dynamic and sustainable growing. And doing it. 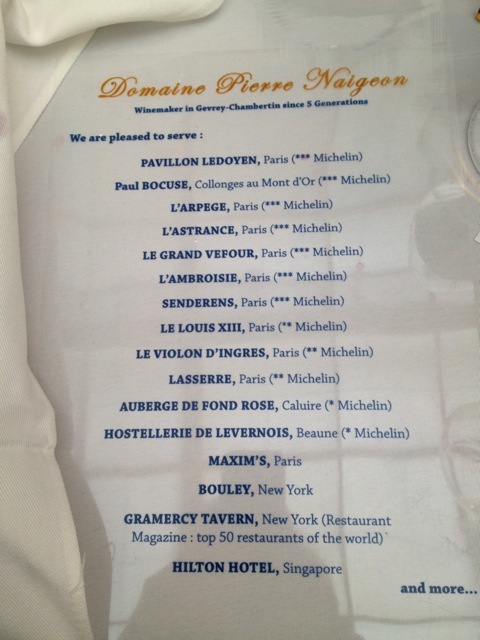 So, we tasted 4 whites and 4 reds…all wonderful but the star of the seminar tasting, and boy did it stand out, was the Mazis-Chambertin, 2009, Domaine Harmand-Geoffroy. The nose alone is worth the 150 bucks a bottle and, if you were so inclined, worthy of splashing all over your body…well, you can figure out the rest. Even though it could age 15 years, it was eminently drinkable now. 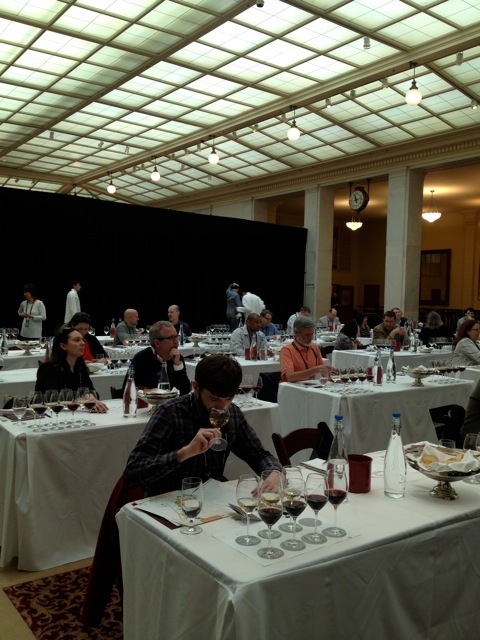 I hated leaving even a single drop in the glass but I knew 200 wines, from 30 producers, awaited in the next room. Aside from my exaltation over the Mazis-Chambertin, I will leave the wine reviewing to others and cover the goings-on of this special event. Walking into the main tasting room is like walking into Tiffany’s…confronted with 30 tables of jewels…I mean Burgundy wines. 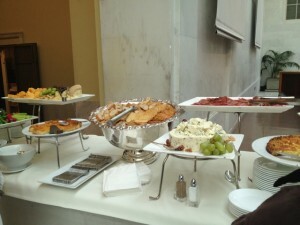 Plus, there was a delicious buffet of cheeses, veggies, meats and nuts to line your stomach along the way. 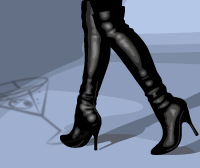 I randomly picked a table to start and was on my way. I asked one of the producers how small wineries could afford to come and exhibit here. He said they belong to the BIVB – whose fees are based on production and AOC not sales. Through the union, they get group rates for flights, hotels and for shipping their wines which would otherwise be prohibitive. Aren’t we lucky they have a Bureau to help promote their wine or we would never be able to experience these singular wines. I asked several winemakers what they thought of California wines and if they’ve had a chance to visit some wineries. Most were diplomatic and said they hadn’t had a chance, a couple smiled slyly and nodded. Laurent Pillot said he went to Napa, diplomatically acknowledged the different styles and said he even had a good cab at Ross (which may be in Sonoma but I didn’t get a clarification). As with all great wines, we are told to wait 10 – 15, even 20 years til they mature and are really optimally ready to drink. Well, some people of a certain age don’t have, let’s say, a 20 year window to wait for wine to mature so I asked what’s drinkable now. 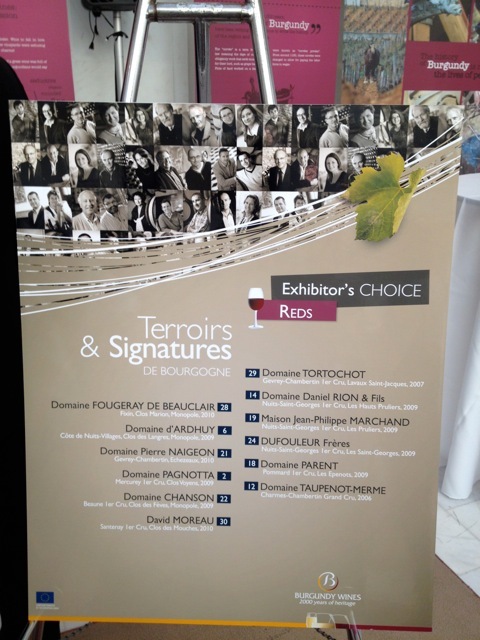 Jeanne Marie de Champs, the genial CEO of Domaine et Saveurs Collection, said she just finished her 1997’s and recommended drinking the 2000 – 20001’s now. Pierre Naigeon of Domaine Pierre Naigeon – fantastic wines – said it isn’t really necessary to make wines that take 10 – 20 years to age. “I make wine not big extraction so they are more approachable now. I am not very patient.” It’s totally a winemaker’s decision whether or not to play to the futures market. So, no need to wait…drink now! 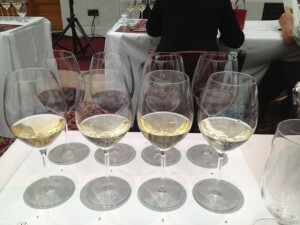 After tasting I don’t know how many wines, palate fatigue inevitably sets in…and I don’t spit (it’s disgusting, right?). I was advised to ‘refresh’ with white wine. I don’t often do as I’m told but this time I did and it helped but not for long enough. I couldn’t taste another fabulous wine. Crazy, eh? I was done but what an amazing wine tasting. Merci Vins du Bourgogne. It was a wonderful afternoon!